FIVE days! !………..And I haven’t posted a single Christmas recipe…. Where have I been lately? Pressure is building up. The Christmas presents are still unwrapped and that gives me what, a few hours before sundown to get it done… because in the next four days I’m gonna be swamped with all things related to Christmas eve and Christmas day. 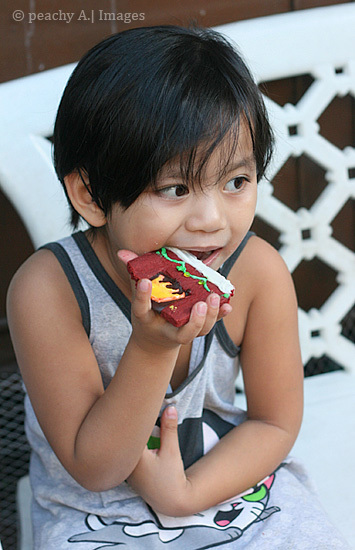 Somehow, I have to squeeze in a Christmas cookie or else..I’m gonna go bonkers all the way. I told myself I can’t handle another gingerbread recipe and if I see one, I’m gonna run down our street screaming. I have a thing about Fireplaces. I know, we live in a tropical country and carpenters will probably think I’m nuts if I start having a fireplace built in my living room in our house…..in the middle of Metro Manila. I couldn’t even wear a sweatshirt here because I will instantly evaporate. …but fireplaces are so darn romantic…and Christmas-y. After all, that’s where Santa Claus goes through to enter the house. So, yesterday… I started having ideas and baking urges…. I thought about making these cookies…..
Good thing I always have gummy bears in my big, blue goody box! All I had to do was make these red velvet shortbread cookies and shape them like a fireplace… dip them in melted white chocolate chips…I had to keep myself from biting them before they’re done. 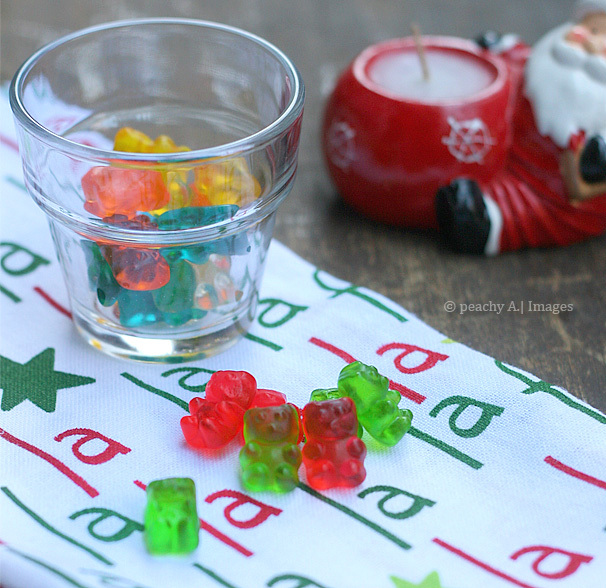 Those poor gummy bears had to give up their arms and legs to be the christmas lights in those fireplaces…. The kids were very happy to eat the crippled gummies. 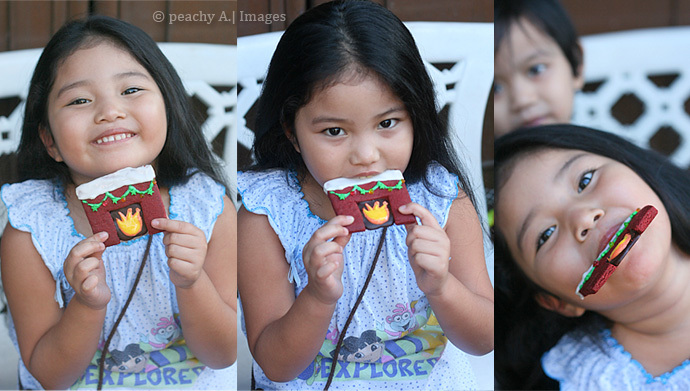 And later, they were happy to eat the fireplace cookies as well…. Preheat oven to 325°F. Roll out the dough to ¼″ thick. Take a knife and cut out 3×3 inch squares from the dough. Then cut out 1.5×1.5 inch squares from the bottom of each square. 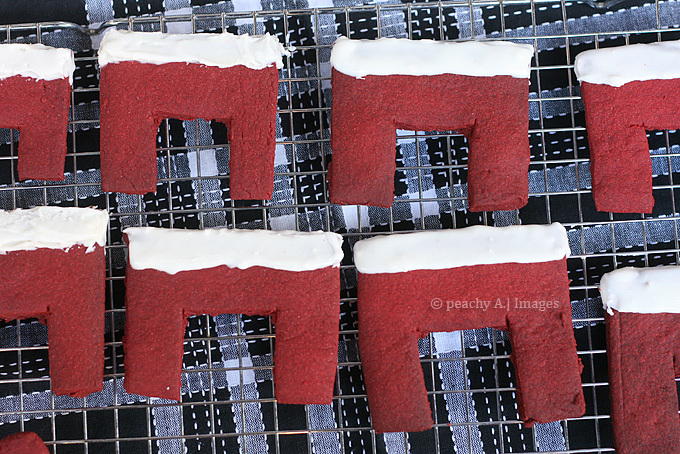 Place the fireplace shaped shapes on parchment lined baking sheets. Chill the sheets in the fridge for 10 minutes. Then bake in the oven for 20-25 minutes. Let cool on a cooling rack. 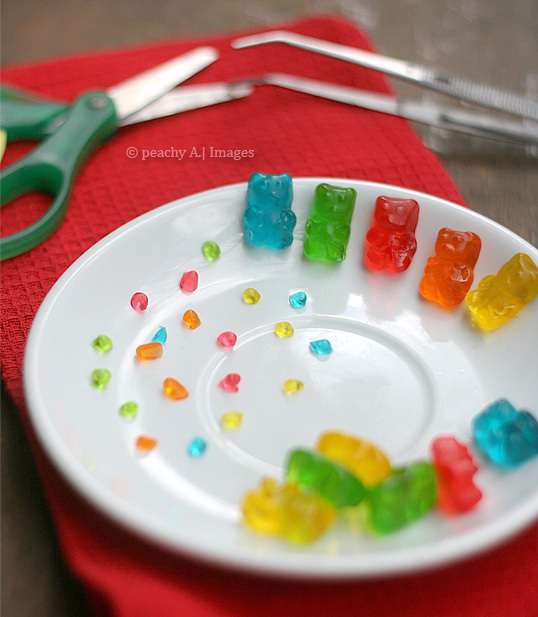 To prepare the gummy bears, take kitchen shears and cut off the gummy bears’ arms and legs and place them on a piece of parchment paper or small plate (sticky side down). When cookies has cooled, dip the top edge in melted white chocolate and place on a piece of parchment paper to dry. Next, take melted dark chocolate and use it to draw rectangles inside the cookie holes. Wait for the chocolate to dry. Mix orange food coloring with some royal icing. Use a toothpick and draw a spiky flame on the dried chocolate. Let dry. Mix some yellow food coloring with some royal icing. Use a toothpick and draw a smaller flame on top of the orange flame. Let dry. Tint some royal icing a teal green color and place it in a piping bag. Pipe three loops of green icing along the bottom edge of the white chocolate. You can also use a toothpick in doing this. Take a gummy bear arm/leg and dip half of it in royal icing. Place it under the green icing “string,” just touching the bottom side. Repeat with the rest of the gummy bear arms/legs, alternating colors. Put green candy stars in between gummy bear arms/legs. Now, it feels like Christmas in here…. Thanks again for stopping by Nom Yum & Free from Full Plate Thursday! Have a Merry Christmas!!! Hi Peach! Thank you so much for stopping by and leaving a comment! 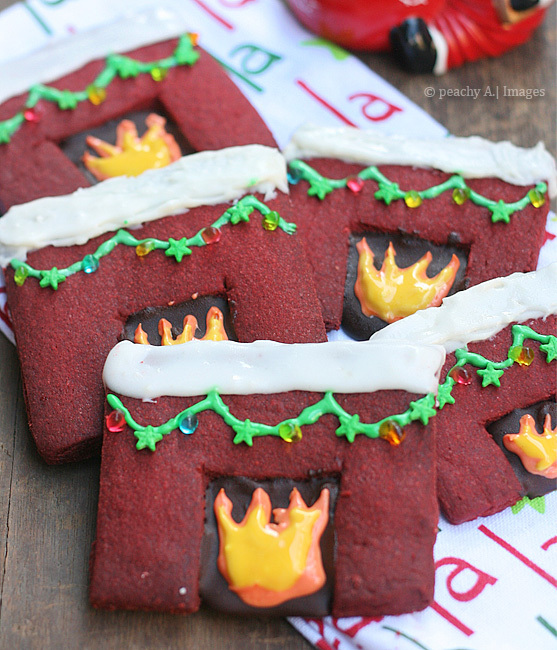 I love your fireplace cookies! So adorable. I am glad I found your blog and look forward to visiting it quite often. 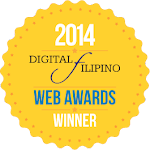 My sister in law is from a little place outside of Manila, I can’t pronounce or spell the name..sorry! My brother has been living there too and he loves it. It’s so nice to meet you and I look forward to keeping up with you. These are so creative and cute! 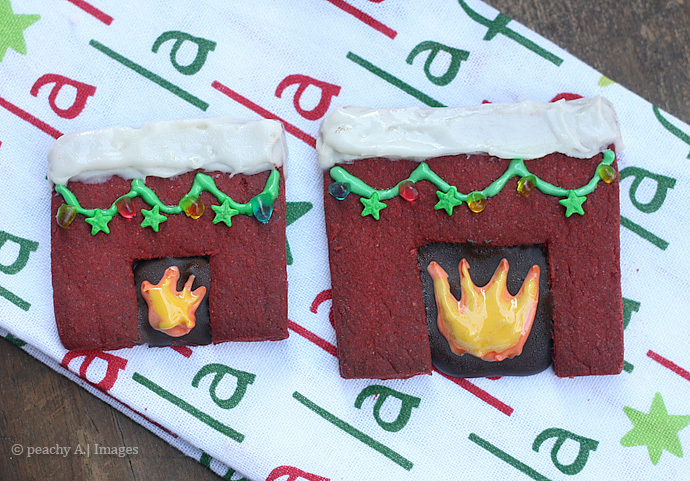 I wouldn’t have ever imagined making a fireplace out of a cookie recipe! This is perfect. I can pair them with my reindeer cake pops! Very festive and pretty! Have a blessed holiday season! 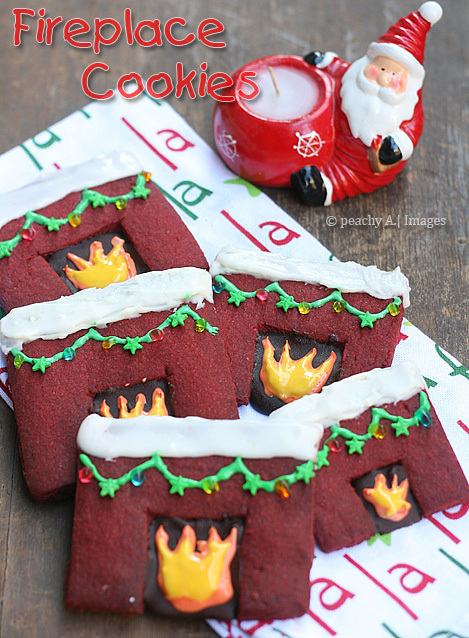 Your Fireplace Cookies are just awesome! Thank you so much for sharing with Full Plate Thursday and a very Merry Christmas to you and your family. You’re so talented. I really love your fireplace cookies. 🙂 Definitely will bring warmth and a smile to anyone who sees them. Merry Christmas and Happy New year to you and your family! My MIL just asked for red velvet! Perfect! These are so cute..Merry Christmas to you & family. That looks so yummy and you are so creative, Mommy!! Here for a late ftf visit! 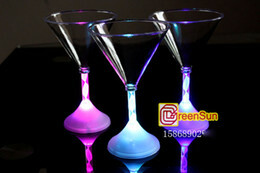 these are great for the holidays! fun to decorate. your kids are adorable!